Alasdair and Sarah’s interest extends beyond building and hiring luxury canal boats, to the history of the ‘Mon & Brec’ canal itself. 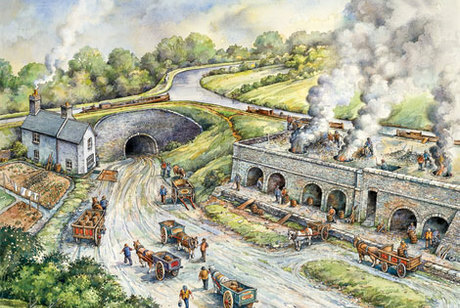 A few years ago they started collecting works, by a local artist and historian Michael Blackmore, which recreate scenes from the canal's past. Prompted by the 200 year celebrations in 2012, they teamed up with Michael to publish a book "200 years of The Monmouthshire and the Brecknock & Abergavenny Canals". Some 40 of his detailed illustrations appear alongside succinct notes from Alasdair, providing insightful commentary on the much-loved Mon & Brec. 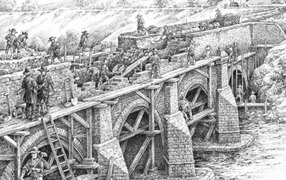 Michael’s detailed interpretations lead the reader through two centuries of development, from the inception of the two original canals to the plans for regeneration in the 21st century. The pen and watercolour illustrations – commissioned for this book - reconstruct scenes depicting the scale of the engineering projects involved in construction: the wharfs linking tramroads to the canals and to the sea at Newport, the lock flight at Llangynidr at the end of a remarkable 22 mile lock-free stretch and the aqueduct over the river Usk on the approach to Brecon. The book charts the decline of the two canals as steam locomotives offered a faster method of transportation, and the waterway’s subsequent regeneration through tourism beginning in the late 20th century. 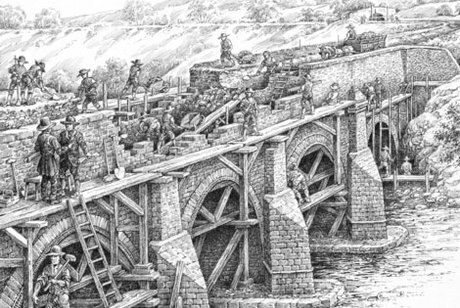 The significance of the Monmouthshire and Brecon Canal in the area’s industrial past and its key position today in the Brecon Beacons National Park and Blaenavon World Heritage Site is vividly brought to life in this highly-collectable book.